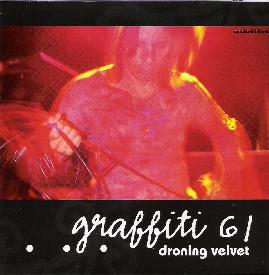 Graffiti 61 - "Droning Velvet"
It is my pleasure to tell you about this new release from a certain Dominic Massaro, a Californian sound artist who is the creative spark behind the name Graffiti 61. Massaro on this CD delves deeper into the electronic ambient realms of the Tangerine Dream style than he did on his last release Mindblossom (see AI #24). However, he has managed to capture a hypnotic/medative/atmospheric movement with clarity and precision, and once again I was not disappointed with the work. Droning Velvet is a 7 track CD featuring tracks of assorted lengths. The tracks range in time between the 2-minute and the 10-minute mark, and each one moves with purpose and with energy. Massaro on his last release dwelt on the more up-beat piece and featured percussive structures that do not seem to figure at all on this release. Yet as I listen to Droning Velvet I realize that meditation seems to be the outcome that takes over me, and I find that if you want to understand it you have to listen intently. When I say this, those of you out there who meditate daily on the Klaus Schulze’s of the world will totally understand what I am talking about. Those who do not soon will. Droning Velvet in my eyes is total meditation. What I mean is, drugs to me are part of the experience, and headphones are of great importance also. Together, and with the relaxed nature that you undertake to listen to this style of music is also important, and that is where drugs come in in my opinion. So now that the mood and scene is set, we find that we can move onward and take part in the journey that Graffiti 61 has formed just for us. Of the music, it is sometimes eerie and sometimes crazy. It is total synth exploration and it is of a very high quality in sound structure and sound itself. The production is very good and the textures of the rolling sequencers and pad sounds rise and place the drug meditation road in front of you. Will you be able to get through? There are folks who hate this music because they say that it is repetitive and that it goes nowhere. But my judgment is, I love it! And I know that anyone with any knowledge of Tangerine Dream, Klaus Schulze and all the other cronies who batter our heads with ELECTRONIC MEDITATION will love this as well. It is a definite matter of taste!!! With tracks lasting around 40 minutes in total, my only qualm is it is too short and the 7 tracks could have been one track without any gaps at all. It does not matter really because the point gets across anyway. But if there were 2 tracks of 20-minutes each without gaps I find personally that the drug journey in my mind would have been more uninterrupted. Well then, I hope that that has been cleared up? Anyway, if synth exploration is what you like, you will like this I assure you. Graffiti 61 ‘Droning Velvet’ is a total journey, and it is constructed very well and it is of a high standard of sound as I have said before. The noises and textures are mellow and strange, uplifting and depressive. It is vibrant through each of its moods and all together shows passion. What more do you want??? For more information you can visit the Graffiti 61 web site at: http://www.graffiti61.com.